How far will Trump go to gut U.S. climate policies? Can the GOP roll back the endangerment finding on greenhouse gas pollution? Graphic by E&E News. Photo by Gage Skidmore, courtesy of Flickr. President-elect Donald Trump would have to undertake a herculean political effort to reverse his administration's responsibility to reduce greenhouse gases, and he might not be able to count on Republicans in Congress for help. In promising to rescind the Clean Power Plan, Trump is clipping a regulation off at the stem, but the roots would survive to pester his administration with the threat of lawsuits and the likelihood of future rules governing the release of carbon dioxide at U.S. firms, according to experts. 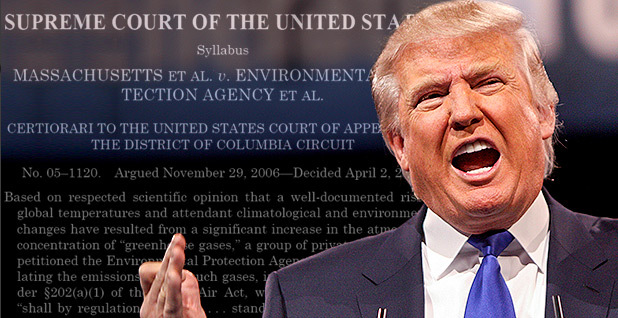 When the Supreme Court ruled in 2007 that greenhouse gases are an "air pollutant," it set in motion a series of actions that could now require Trump to convince the courts that global warming is not adversely affecting humans and the Earth — after the same court, the U.S. Court of Appeals for the District of Columbia Circuit, came to the opposite conclusion in 2012. That effort would occur if Trump's U.S. EPA tried to reverse the so-called endangerment finding of 2009, a tick-tock in the bureaucratic record that gave rise to a cascade of regulations on greenhouse gases over cars, power plants, natural gas wells and more in the future. The finding is EPA's trigger to regulate. Trump's campaign said before the election that he would "review" the endangerment finding. To reverse it, he could offer a new rulemaking that provides scientific evidence rebutting reams of mainstream climate science included in EPA's initial endangerment finding, said David Doniger, a lawyer with the Natural Resources Defense Council. 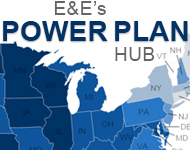 The rule would likely be challenged in court by states and environmental organizations. And it would land, likely, in the D.C. Circuit, which handles cases involving the Clean Air Act. The same court rejected similar arguments against the endangerment finding in 2012, affirming EPA's trust in a host of scientific bodies that say carbon dioxide results in higher temperatures and health risks to people. Doniger gives Trump little chance of winning that fight. "The role of judges is to uphold agency fact-finding, unless it's arbitrary and capricious," or, in other words, if it's "off-the-wall, it makes no sense," said Doniger. "You might get away with two and two equals five ... but you won't get away with two and two equals 100," he added, referring to potential GOP claims that temperatures aren't rising. "The courts will not defer to stuff that borders on crazy." Trump could also use legislation. He could urge Republicans in Congress to invalidate the endangerment finding, which the Supreme Court said in 2007 is a necessary step before EPA could begin regulating facilities for greenhouse gases. Or Trump could go after the deepest root of all, by explicitly stating that greenhouse gases are not an air pollutant. That could take a heavyweight political effort, according to observers on both sides, that would involve changing the Clean Air Act. Some Democrats see that as the ultimate act of climate denial. It would reject countless scientific studies showing that temperatures rise with increased levels of carbon dioxide in the atmosphere, and its impacts on things like sea-level rise, heat waves and precipitation. That isn't being discussed as an option, said Sen. Shelley Moore Capito (R-W.Va.), a member of the Environment and Public Works Committee. Asked late last week if she wants to undertake the task of undoing the endangerment finding, she replied, "I would say, in answer to that, no." "A lot of people might consider that to be the root of the issue, that all these other things emanate out of," Capito said. "But I think it's probably — it's just not something that's been high on the discussion." Instead, she said Republicans will focus on achieving Trump's promise to negate the Clean Power Plan and regulations on wetlands and streams, and "maybe some of the ozone issues." "Those are the ones that I'm most interested in, that are most immediate," Capito said. Others say they hope Trump goes full speed ahead, including groups that are affiliated with members of his transition team. The Competitive Enterprise Institute (CEI) is urging the president-elect to target the Supreme Court's ruling in 2007, under Massachusetts v. EPA, that carbon dioxide and five other greenhouse gases are air pollutants. Myron Ebell, who questions whether climate change will affect the Earth, is heading Trump's transition team at EPA. He oversees the Center for Energy and Environment at CEI. His colleague, Marlo Lewis, a senior fellow at the think tank, said in a statement to E&E News that "we want Congress and the President to amend the Clean Air Act to clarify that Congress has never authorized the EPA to regulate greenhouse gases for climate change purposes." That would provoke a fierce fight on Capitol Hill. "When it comes to legislation to undermine the Clean Air Act, they're going to have a very tough time," said Sen. Brian Schatz (D-Hawaii). Doing that would require 60 votes, eight more than Republicans will likely have in 2017. "Let me put it this way: I think they're going to try everything, and they're going to try it all at once," Schatz said of Republican attacks on environmental measures. "They'll try riders, they'll try administrative actions, they'll try to utilize the courts. We have to understand this is going to be a fight."